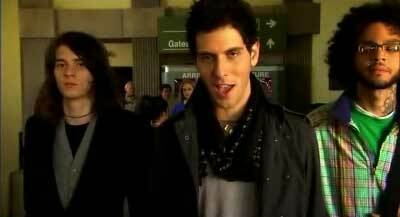 Cobra Starship perform the music video during the final credits for the movie, “Snakes on a Plane”. 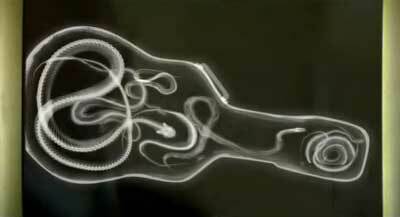 In an airport, members of the band prepare to walk through security scanners, cases full of snakes, before boarding a flight to Los Angeles. Cobra Starship is largely the work of Gabe Saporta, lead singer with Midtown. Saporta gained a lot of online attention for “Hollaback Boy”, a spoof of Gwen Stefani’s “Hollaback Girl”. Saporta heard about the new movie, Snakes on a Plane, and decided that he was well placed to get a music video inserted into the movie. The resulting music video, “Snakes on a Plane (Bring It), provides an ironic comment on the snakes working in the music industry. Appearing in the video with Saporta are William Beckett, leader singer of “The Academy Is, Travis McCoy hip hop artist with Gym Class Heroes, and Maja Ivarsson singer with Swedish group, The Sounds. F**k em, I don’t care. we’re going down in flames, hey. Honey, I’m gonna make it out alive. I can see the venom in your eyes. As the group approaches the security scan, the woman poses evocatively to attract the attention of the security offical, distracting him from the cases full of snakes. It’s just a little turbulence. 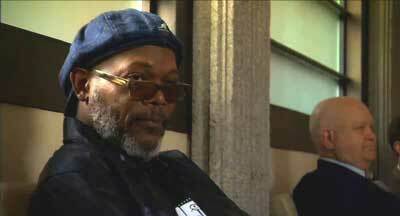 As the band boards the plane, Samuel Jackson, reading a book in the boarding lounge, looks up, assesses them briefly, and adjusts his glasses. Filming was directed by Lex Halaby, producer Mark Staubach, executive producer Cathy Pellow, director of photography Johnny Ching, production manager Annette O’Neill, production designer David A. Novak, and editor Russ Lichter.